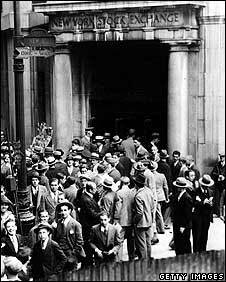 "After the crash, I was one of the few left in our office," says Russell Bickell, nearly 80 years on from the Wall Street Crash. Now nearly 97 years-old and still working as a financial adviser, Mr Bickell can see plenty of similarities between the current crisis and that of 1929. "There was a lot of borrowing going on before the crash, just like today, and everybody was very happy," he says. "People were making lots of money, but then suddenly things started to change." Mr Bickell started off at the age of 17 years old chalking up the stock prices at a brokerage in the small town of Reading, Pennsylvania. 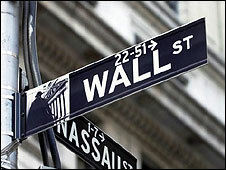 As Wall Street went into financial freefall on 24 October 1929, he found himself being quickly promoted as his brokerage began to shed staff. Gradually rising through the ranks and riding the effects of the depression that followed, Mr Bickell finally made it as a fully qualified broker by the mid-1930s. But during the turbulent years at the turn of the decade, he found that work in financial sector was not enough to support his family. "After the market closed and at weekends, I would take the train to go and work in a shoe store," says Mr Bickell. "As I was living at home, the two jobs allowed me to contribute something to the upkeep of the house." 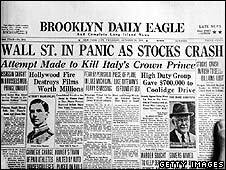 Between 29 October and 13 November 1929, when stock prices hit their lowest point, more than $30bn disappeared from the US economy. As stock values plummeted, investors with all their savings in the market realised the scale of their losses, prompting mass panic. For many investors and brokers, the situation was too much to bear. Rumours began to spread of people throwing themselves from their office windows. While many of these accounts later turned out to be exaggerated, the shock of the crash did push many to take their own lives in order to escape their financial woes. And despite its distance from the financial district of New York, Mr Bickell's home town of Reading did not escape unscathed. "I remember two people in the town committing suicide as the effects of the crash hit home," he says. As the gloom spread to all parts of US industry, the number of unemployed people reached upwards of 13 million and signs saying "No Men Wanted" began to be displayed around the country. For Mr Bickell and his colleagues, the downturn forced them to take compulsory leave as their firm struggled to survive. "It was quite common in the brokerage business that one week every month we'd take a week of unpaid leave," says Mr Bickell. "It became very common across the brokerage industry and became known as Scotch Week." Like the final months of 1929, the past few weeks have seen the foundations of the US financial system creak under the weight of decisions made in the most powerful banks of Wall Street. And after nearly 80 years in the financial industry, Mr Bickell finds himself once again buffeted by the winds of another economic storm. Now working at a branch of Wachovia Bank in Wyomissing near his home town, he has seen the events of 1929 repeat themselves with uncanny similarity. Like many banks after the Great Crash, his current employer has recently ensured its survival by agreeing to be bought by its competitor, Wells Fargo, after a protracted period of uncertainty. Sitting at his desk, casting his eye over the latest news of the takeover, Mr Bickell jokes that his experience of 1929 could be a valuable commodity for financiers currently fighting the latest crisis. "I am slightly annoyed that I don't seem to have been consulted on the latest deal, but then again, that may be because I am turning 97 years old next month," he says.